The Paleo challenge was great for me personally overall. It was difficult at times, but isn't life? I think there were two main cravings I had: salami and soy-marinated meats. I managed to stay away from salami but the meats I just had to have. Honestly it wasn't even as good as I remembered so it was kind of a pain because I felt like the cheat wasn't even worth it at times. Other than that, baked goods didn't bother me too much. I think sometimes my problem is not being able to just eat one bite of a cake. But if I don't even eat it to begin with - no problems there. One major challenge for me was how people responded to me not being able to try something they were eating, or what they wanted to eat. That was probably the most frustrating part. I hate cooking rice for my boyfriend and not even taking a bite. I also hated it when he would order my favorite pasta while I chomped on salad right next to it. I eventually figured out that if I just made yummy foods, he would eat it without knowing what it is. Now he wants coconut flour pancakes every weekend. I also hated my coworker that would say "JUST EAT IT" when I told her I didn't want to try what she made. My friends were annoyed at how boring some of the restaurants I picked out and they just decided to not eat out with me at all. But eventually with that frustration, it actually made me stick to the diet even more. Instead of eating out, I'd offer to make them dinner. Plus I felt and looked great..and I know I didn't get there by eating french fries all day. I did lean on a few people that loved health and fitness as much as I do and they both really supported me through encouragement. I will try to keep up the diet with a couple of modifications and cheat day once a week after this challenge. As far as others are concerned, I think I will just blame it on allergies instead of explaining why I'm being healthy. Diet and exercise was easy to track and I did really well overall. I managed to only miss 1 day of any exercise because I was sick. Since I have puppies, even on the non-gym days I would at least walk them for 45 minutes. The hardest part was sleep. I did really for the first 4 weeks and was consistently 15-30 minutes late for work. After that I started going back to 6-7 hours just to get to work on time and I could tell I wanted to work out less because I was still tired. The last week was the worst, hardly any sleep and I'm cranky and tired all the time. Sleep is important and for someone like me that always have things going on in the evening or weekends, I need to make a solid effort to get to bed since I have to be up so early. Overall I lost about 6 pounds. Number-wise it isn't very much and I would be lying to say that it isn't frustrating...but I'm trying really hard to not focus on it because I look and feel great. I just know that someone with more weight to lose will probably smoke me in that area. My goal was to have a 2 pack, and right now it is looking pretty good (with proper lighting). I know what my problem areas are and will continue to work on it through continuing my own version of the challenge. I did not take measurements but I know for sure my clothes are fitting better. This challenge was an amazing experience and I can't wait to incorporate it with the rest of my life. I believe in that this is what works for me. I can eat healthy things, ingredients I can pronounce and I don't have to worry too much about calories counting and portion control. If I'm hungry I just snack away on natural foods. I even picked up a couple books on Paleo. Mainly to understand it more but also to have a better response when people ask, "why can't you have beans?" Thank you for this wonderful experience...and I'll be up for it the next time around, too! My tip for getting and ready for your morning boot camp session. It's going to get colder here in Pasadena so getting out of bed and to boot camp on time might be a little more challenging for some. My tip is to have some strong green tea, coffee, or mate´before you leave the house. For those of you here in the Pasadena area, I get my mate´from the Argentinian market at 1272 Villa St. It comes "loose"in a bag like a bag of sugar. If you buy it in this manner, you'll need to buy the special "bombilla" or metal straw. You can also get it at Trader Joe's, in a "tea bag" option. Look for the brand name Guayaki. I've been anticipating the release of Tim Ferriss' new book, The Four Hour Body...and one of the tips that makes sense, and which I think will help you is to take a picture of your meal. Yep, snap a picture and then post it on our Facebook Page. You can upload it, then just "tag" it with Boot Camp Pasadena. I know that some of you may want to wait and do this with our upcoming Paleo Challenge, but I encourage you to get started now. If you'd like receive information about our upcoming Paleo Challenge (Jan 3, 2011), and other news, join us here. 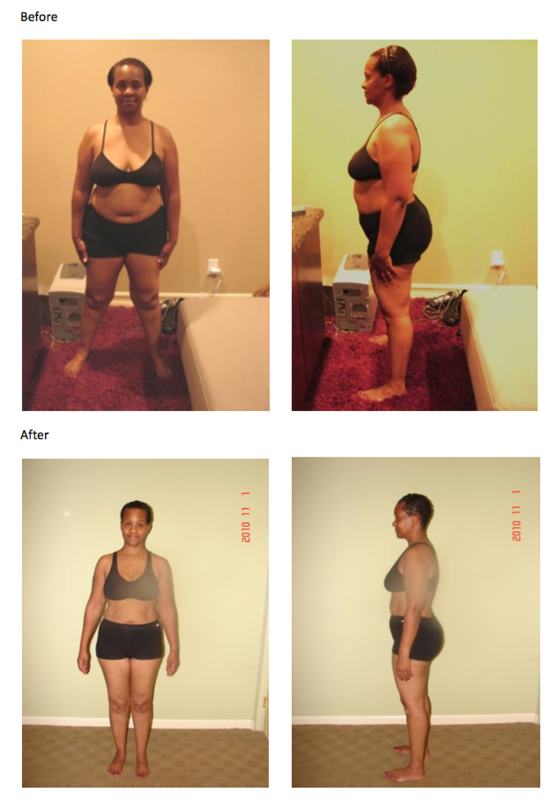 My weight at the beginning of the challenge was at 169 lbs, knowing I had gained 18 lbs within 5 months after stopping the lactation/nursing process of my infant son. The weight gain became one of the factors of my depression. I was accruing anxiety and panic attacks with the medications for my depression. Having physical and mental limitations with my body, affecting me, I was not able to continue the boot camp due to my carpel tunnel and tendonitis of the wrist and arms. This challenge made it quite the experience to attempt weight loss. I was on my own, since I was not able to have a mentor or trainer monitor my progress. Measurements were not taken before the challenge as I felt it would discourage me. I allowed the fitting of my clothes to guide me and instruct me if I was either gaining, losing or remained the same. In my attempt to begin this change of a new beginning through Paleo, it turned into a great and much bigger challenge for me. My exercise was very limited, it consisted of plenty of power walking, jumping rope, jogging, and running. Attempting to track my disciplines in writing was not an easy process. Keeping track became a memorization tactic. I would not call this a diet because I was still eating real food just not the extras. This challenge became a family affair. My partner attends the boot-camp and also joined the Paleo challenge. This began to motivate me, not to turn back or give up, though I had my moments. This included our three children; how we ate, and how active we remained, along with sharing the same intake of foods we had to encounter for the challenge. Meanwhile accumulating the energy needed to pull us through. The urge to cheat was always a thought, for the sake of the kids and ours. With the cheating came the circumstances: the extra push and training the following day, or simply eating in moderation. Parking quite some distance to get to and from our vehicle when going somewhere. Our eating habits that we become too familiar with according to our upbringing seem so natural and worth the good eats. Allowing myself to sleep the recommended time gave me plenty of energy to exercise and have three actual meals. Learning from the Paleo challenge showed me that real food is just simple. The first two weeks and the last two weeks became the hardest. The food portions became smaller and my hips followed. I began to use a belt to hold my pants up, when before my hips and thighs would have sufficed. I did not have drastic results at the end let’s just say I do not have the extras hanging off my body. Final weight is 154 lbs, 15 pounds lighter,. I was able to walk up a steep hill last night with no trouble while trick’or treating with my 21 month old felt wonderful. I am currently able to go a few weeks without my medications for pain and my depression as my life modification has kept me occupied. I would not consider this a diet. The Paleo Challenge provides one with energy from morning to night. I am glad I did not give up at week 2 when all my determination was out the door. P.S. We are planning our next Paleo Challenge which will begin on Jan. 3, 2011. To get news of this Challenge, please sign up here. 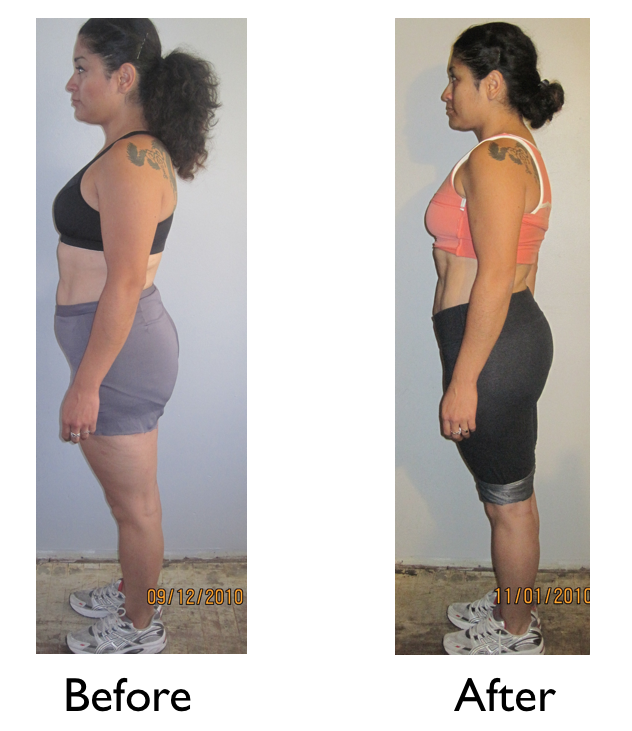 "Weight at the beginning of The Paleo Challenge was 228 lbs. Weight at the end of the challenge was 210 lbs. Waist line in the beginning was 42in., and now is 38in. Initially I was a bit skeptical about the challenge. I had a hard time the first two weeks but started feeling better shortly after. I noticed I had a lot more energy during the workouts and throughout the day. Before the challenge my thinking was a bit foggy and after a couple of weeks I started to think a lot clearer. I started to enjoy the diet more and more. The better I ate the better I felt. I also started sleeping better, which I think came from having a good diet. The only problem was I started craving lots of sweets. This is funny because I’ve never craved sweets before. I would take care of these cravings by having fresh or dry fruit. I realized I don’t need bread, pasta, or tortillas (as a Mexican tortillas are part our every day diet). I’ve decided that I am going to continue with this diet because it’s a necessary life change. I've been riding the bike to work and going uphill minus 18lbs. makes a huge difference!" A quick round up of the Paleo Challenge. 18 people entered the contest. 12 finished and submitted pictures and an essay. I will be posting the transformation stories, as the contestants allow. Marie and I were truly inspired from the changes of the contestants and also how the Challenge affected the entire family, not just the competitor. One of the main points that we came away with was that the Paleo Diet is a do able way of eating. It is a lifestyle, not just a temporary diet. I don't remember any of the contestants saying that they would revert back to their old ways of eating. Just like I always say, being lean and healthy comes from consistent effort. There are no shortcuts. To all of you who competed and finished, I am sincerely proud of you. Even if you didn't "win" one of the top 3 spots, you are a winner with me. I totally respect your commitment and that you did what you set out to do. So many "talk", but so few "do". You did it, so a big congratulations to you. As your coach/trainer/teacher it's difficult for me to describe how happy I am with your transformations. Can you believe it? Time is flying and November first will be here very soon. Only 2 weeks left. I went grocery shopping this weekend at Trader Joe's. I bought what I thought were 3, pretty healthy looking items for my kids. The packaging mentioned things like, low in calories, organic, baked not fried...sounds pretty healthy doesn't it? But.... They all had sugar. What the heck? Sugar in chips? Pretty deceiving if you ask me. Lesson learned. Watch your labels and don't assume. I just got off the phone with one of the boot campers who is also doing the Paleo Challenge. He's feeling way better, is thinking more clearly...and he lost 7 pounds in one week. I know ladies don't hate him. It's so cool for me to hear stories like his. Remember we're talking about eating real, wholesome food. And look...it pays off big time. * A remeinder for those of you who need Paleo recipes, I always recommend that you go to, http://everydaypaleo.com/ Sarah does an incredible job on her site! Thinking about recipes, I have Robb Wolf's book, The Paleo Solution on my desk to read...and there are recipes there too. Tues and Thursday classes begin on Tuesday October 12. We are looking to add a Tues and Thur night class. Please contact me if you would like to take this class. We will open it if we have enough people, but I need to hear from you. I honestly don't have much of a rain policy. It rains so few days out of the year and the chance that it would actually hit in one of the hours that you are at camp is pretty slim. Morning Sessions- We can always meet in the main hall at the school if it is raining...so morning sessions are never cancelled because of rain. Evening Sessions- These can be a little bit more tricky because we don't usually have access to the hall. We will meet under the overhang near the class rooms if it is raining hard. If it is misting you can expect that we will be training in the "elements". This is CA after all, and the weather is not that bad. Posting updates about rain- I will post all updates or news about rain right here on the blog. Think of this as "message central". Come here first, rather than Facebook, etc..
P.S. I train myself rain or shine...just like today I am training at home at 11:20, and I'll be outside rain or shine...no excuses. I don't expect you to train in the rain/mist while I make excuses. I expect the same from myself just as I do of you. P.S.S. If you'd like to be in one of the next boot camps, and haven't already contacted me, please do so soon.